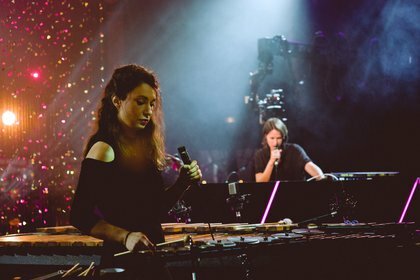 This off C:N Showcase features Chloé – AKA Chloé Thévenin – and percussionist Vassilena Serafimova joining forces. Chloé is a French composer, Producer, remixer and DJ with a gift for thumping beats, arresting soundscapes and samples, and mesmerising vocals. In addition to starting her own record label Lumière Noire, Chloé has appeared on compilations, and released her own EPs, albums and remixes. Vassilena Serafimova is co-founder of the International Marimba and Percussion Festival in Bulgaria. 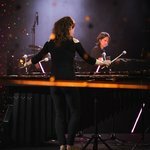 Although Serafimova plays percussion generally she refers to the marimba in particular as “my little jewel.” Serafimova has won numerous awards and played in some of the world’s great concert halls, and she is, like Chloé, a serial collaborator. 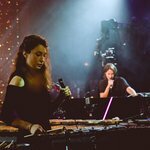 In performance Chloé and Vassilena Serafimova fuse the marimba’s percussive and melodic possibilities with the limitless sound world of electronic music. It is, in their words, a “hypnotic fable … inspired by pioneers of minimalist music of the 70s.